Counter-Strike Global Offensive, or more famously known as CS:GO, has become one of the biggest electronic games of this generation. With over 200,000 active players and major tournaments worth $1 million, it is safe to say that Counter Strike is leading the charge for the E-gaming market as well as E-sports in general. While it is true that Counter-Strike is completely a skilled-based game and there are no unpredictable factors in terms of gameplay, having the right peripherals can completely change your playing experience. But with major gaming accessory manufacturers charging $100 or $200 for peripherals, people will have to look for cheaper, yet equally durable and functional mice. The Zowie EC2-A is the consensus pick for the best FPS mouse on the market today. 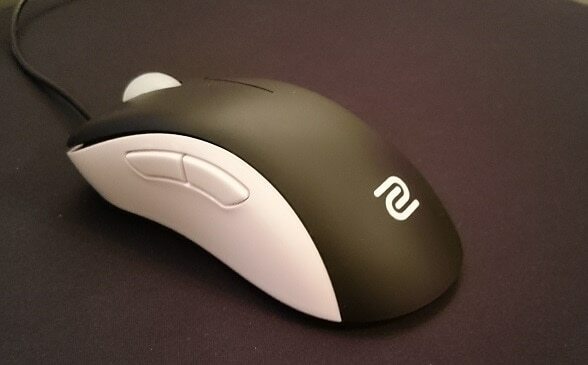 The Zowie EC2-A by Benq is a very versatile gaming mouse that focuses more on functionality than style. The mouse comes equipped with two extra buttons on the thumb side and a designated DPI button beneath. The mouse features an LED in its scroll wheel, which is also an indicator of the four different DPI settings ranging from 400 to 3200 DPI. The mouse features an incredibly ergonomic design that fits medium-sized hands as well as a plug and play design that removes the need for installing drivers; this can save you time and the hassle of finding drivers. Design wise there is nothing really special about the Zowie EC2-A but that’s not really what the product was striving for. Featuring five buttons, the product looks great. The Zowie EC2-A features an extra button, which allows you to change DPI settings on the fly. The LED in the mouse wheel also indicates the current DPI of the movie, Red (400), Purple (800), Blue (1600), and Green (3200). Although it is a shame that you cannot change the LEDs to your liking and the mouse doesn’t have more LEDs, it all fits with Zowie’s function over fashion design. The mouse sports an overall black color with the company’s logo at the edge in red. The mouse comes in an incredibly durable plastic material with an ergonomic design that allows you to play for multiple hours without experiencing Carpal Tunnel syndrome. The Zowie EC2-A comes equipped with a 2m cable which connects to either a USB 2.0 or 3.0 port. You can also change the polling rate for the mouse for better customization options. While online lag is something that you will have to face at times when it comes to online games, input lag is not acceptable and can completely ruin the experience. Zowie, unlike most peripheral manufacturing companies, understands the problem of having smaller hands. With this in mind, the Zowie EC2-A comes in a relatively smaller size that fits better for people with medium-sized hands. There is another model by the name of EC1-A that caters well to people with larger hands. Finding the right mouse can completely change your gaming experience, something that is possible with the addition of the Zowie EC2-A. You can take your CS: GO gameplay to the next level with this mouse! If you’re still torn on which Zowie Mouse to buy, check out the below video for a rundown from our friends at Rocket Jump Ninja.